-Create cupcakes according to the box’s directions. -In a large bowl, cream together butter, shortening and vanilla. -Add in powdered sugar, ½ cup at a time, beating well after each addition. -Mix in milk, and beat until light and fluffy. -Apply frosting to cooled cupcakes in a spiral design using a cupcake decorating tool. -Taking your marshmallow, use the gel frosting to draw on two eyes, and the mouth. 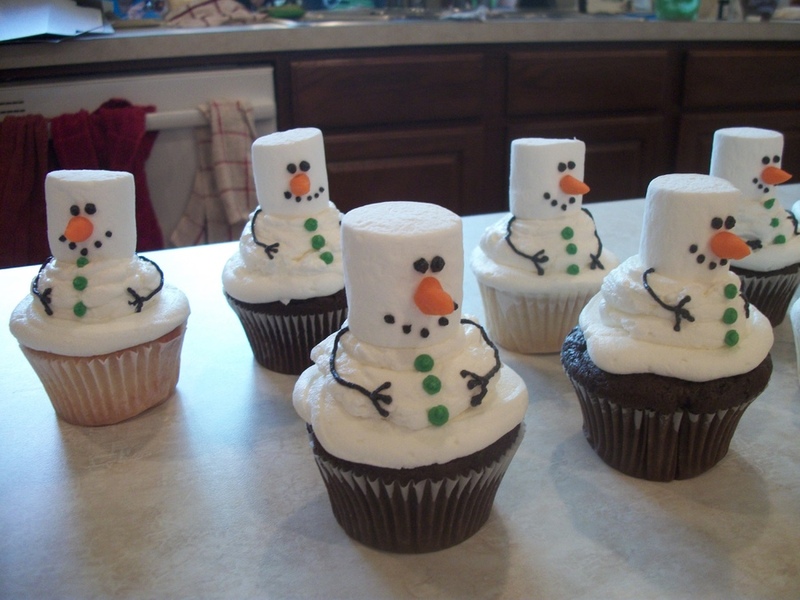 -Using an orange sprinkle, dab a bit of frosting onto the back and place it in the center of marshmallow for nose. -Place marshmallow into the center of your cupcake. -Using the gel frosting again, pipe two arms on each side of the marshmallow. -Place your green or red sprinkles on to the body. -Store leftovers in an airtight container.